Once upon a time, and not all that long ago, there really were tuition-free public colleges and universities in the United States. ‘Tis true! During much of the 1960s (in the early years of the Master Plan for Higher Education in California, 1960-1975), the three public higher education systems in California – the University of California System (UC), the California State College System (CSUC), and the state’s community colleges – did not charge tuition for in-state residents. Yes, students paid some nominal (called “incidental”) fees. But tuition, we as think about it and know it today, was not an essential part of the financing plan for public higher education in California five decades ago. 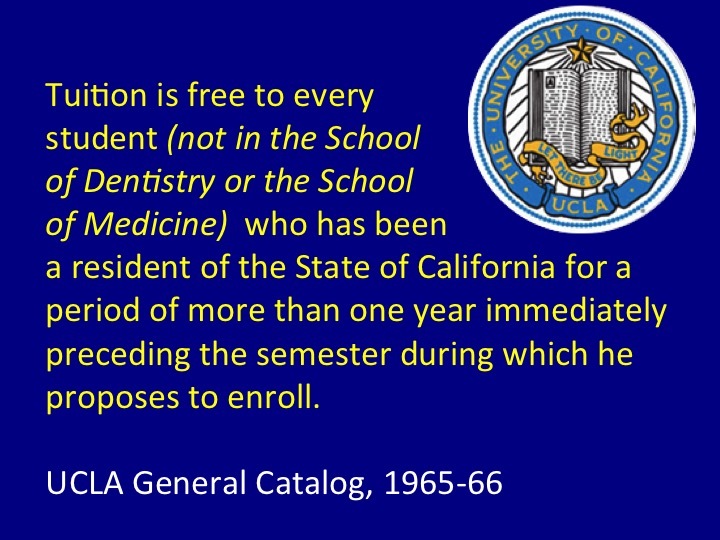 Indeed, as shown above, UCLA’s 1965-66 Course Catalog states that “tuition is free to every student (not in the School of Dentistry or the School of Medicine) who has been a resident of the State of California for a period or more than one year immediately preceding the semester during which he proposes to enroll” (p.57). The estimated annual cost for undergraduates at UCLA in 1965-66, shown below, makes no reference to tuition for in-state residents. 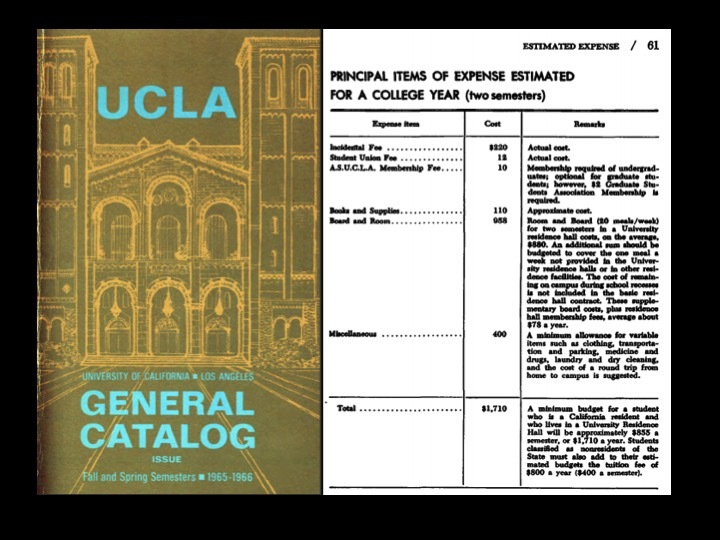 Total estimated (minimum) costs for in-state residents at UCLA in fall 1965 was $1710, of which more than half – $958 – was for on-campus room and board (a dorm room and 20 meals a week). The transition to student fees (a rose by any other name?) in the UC and CSUC systems began shortly after Ronald Reagan was sworn in as governor of California in 1967. As reported by the NY Times in 1982, Gov. Reagan “fought hard in the Legislature to impose tuition at four-year colleges.” He lost the battle for tuition, but the California Legislature “agreed to increase student registration fees, which [previously] had been nominal.” The official “no tuition” policy in California’s community colleges ended in 1982. Fast forward to 2016. The presidential election underway has seen some discussion, both symbolic and substantive, about higher education. As a group, the Republican candidates may rail against rising student debt and the escalating cost of higher education. Yet most GOP hopefuls have not offered plans to address either. This past weekend I could find no policy statements or proposals regarding tuition, college costs, or student debt on the official websites for candidates Cruz, Kasich, or Trump. There is a statement about “how to overhaul” higher education” on Marco Rubio’s web site. Among the two Democratic candidates, Secretary Clinton’s debt free college plans and Senator’s Sander’s tuition free college proposals, as repeated in their televised town halls and debates, sound increasing like the “tastes great/less filling” argument of a Miller Lite Beer commercial. Secretary Clinton and Senator Sanders appear to agree, fundamentally on the basics: the disagreement is on scope (for all students regardless of family income, or just for low- and middle-income families) and how to pay the states for subsidizing more students in public institutions. Interestingly, and unfortunately, both the personal and policy memory of tuition-free higher education from an earlier era seems lost in the current election cycle. Yes, there was the 2015/pre-election cycle of tuition-free community college proposals in several states (article and podcast) and a similar national proposal by President Obama. However, I’m hard pressed to recall any passing mention, let alone serious commentary, in the higher education media or elsewhere, about the past state and national experience with free tuition at public colleges and universities. Admittedly, the financial resources of the states to support education, both K-12 and higher ed, are significantly different now than was the case in the 1960s. There is more competition within the states for money to support K-12 and higher education, health care, highways, water, prisons, and other infrastructure resources and services. Would it be useful to at least acknowledge the past experience with no tuition in the current financial context and political climate? Yes? No? or Maybe? Unfortunately, the past experience with no tuition may be a moot issue, up to and beyond the conventions and into the fall election. Here as elsewhere, the policies and posturing that separate the candidates and political parties may mean that experience, evidence, and insight have a sadly diminished role in the public and political discourse about higher education.